Bob Pawlo: Mom’s always right. Valerie Naranjo: (laughs) My mom was my heroine, and she was always right! I loved drumming! My mother didn’t tell me until a few years ago that she herself wanted to be a drummer. She was not allowed to study drumming because her grandfather realized that she would be playing in places where people might get together and drink, which he thought was not a healthy way for a young woman to grow up. Bob Pawlo: After you graduated high school, what did you do next? 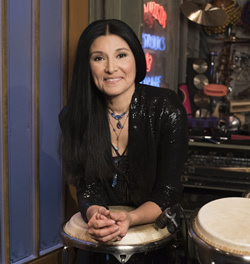 Valerie Naranjo: I started at the University of Colorado, with the world percussion megastar John Galm. There I discovered the gyil, which changed my life forever. Bob Pawlo: For our readers, could you describe the gyil? 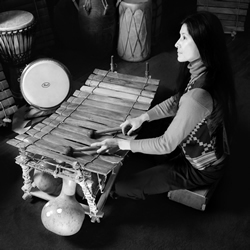 Valerie Naranjo: The gyil is the grandparent of the modern-day marimba. It, like the marimba, is a series of wooden bars that is suspended over a frame from which are hung resonators. The gyil is tuned by hand, with bars suspended over a frame that sits very close to the ground. Its resonators are calabash gourds. Most villages in the gyil parts of West Africa have a gyil master. He assembles the materials, including spider’s egg cases, which are placed over holes that are cut in each resonator to produce a buzzing sound. Marimbas of Mexico also create this buzzing sound. Bob Pawlo: Did you study the gyil for your entire time at the University of Colorado. Valerie Naranjo: Actually, I decided to transfer to the University of Oklahoma, where I pursued a degree in vocal and instrumental music education. At O.U., I met the great marimba pioneer Leigh Howard Stevens, who was visiting from NYC. He was turning solo marimba into a very, very high art. In my senior year, I came to Manhattan for ten days to study with Leigh and got acquainted with the New York City loft scene. You’d go to an informal venue and hear musicians come from their gigs and improvise with each other. It was everything that I hoped to understand about how musicians inspire people and give them energy to go to work the next morning. It was the American version of what happens in West Africa. People gather around and make spontaneous live music to regenerate, rejuvenate and garner the courage and confidence to move forward in their daily lives. So I moved to New York right after I graduated. I remember walking into a restaurant called Foro-Italico and asking if they needed a waitress. The proprietor said, “Well, no, I don’t, but why are you here in New York and who are you?” I explained myself, and he said, “This is strange, because I just let go of a classical guitarist who played here. Would you like to bring your instrument tonight so I can hear what it sounds like?” I played that night, and that summer between undergrad and grad school, I had a five-night-a-week gig playing solo marimba in an Italian restaurant. Bob Pawlo: And what type of stuff did you play? 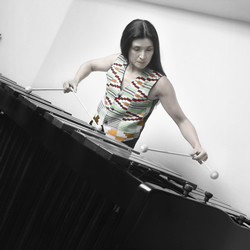 Valerie Naranjo: Everything from Stevie Wonder to Bach to Scarlatti to Mexican marimba tunes. Finally, one day, a patron asked me, “Have you ever considered playing on the street?” I told him, “That’s not practical. I mean, look at the size of this instrument.” He asked, “How’d you get it here?” “I have a little hatchback Nova.” “Then take your Nova there!” He suggested that I set up in front of the Metropolitan Museum of Art. I went and played, and trumpeter Scott Peebles walked by and heard me. Scott showed up in my apartment a week later because he happened to be a friend of my husband Barry, who’s a jazz pianist and trombonist. He said, “I really enjoyed what you did the other day, but I have some suggestions for you. You need to really talk to and connect with the people. Make them feel comfortable.” I took Scott’s advice, and I was overjoyed! My tip jar got filled, and people seemed to have a nice time. So I took that energy to graduate school, where I studied with the great marimba pioneer Gordon Stout. Performance majors were required to do research about the history of their instruments. The thinking was that as a performer, you’ll probably do clinics or master classes or at some point be called upon to educate your audience about your own instrument. I chose gyil as my subject, and found that there was very little scholarship about the instrument. I came to realize that this was actually a problem. When I moved back to New York City, I combed through record shops, and eventually happened upon the African Record Center in Harlem. I walked in and said, “I am looking for African marimba music.” The proprietor turned around, pulled out the album “Kakraba Lobi – Xylophone Master from Ghana,” and said, “This is exactly what you’re looking for.” I took it home, put it on the player, and it immediately spoke to me! It’s funny – as much as I loved marimba music, I also loved artists like Parliament Funkadelic and Santana. I’d ask myself, “I wonder if Parliament Funkadelic have ever gotten together with the marimba?” When I heard Kakraba Lobi, I realized that not only are the two styles musically fused but actually Parliament Funkadelic got its material from this ancient keyboard instrument! I realized immediately that this was not only the rhythmic concept of pop music but also the harmonic concept. Bob Pawlo: So did you start playing gyil gigs around NYC? Bob Pawlo: And just to remind our readers, this is a tradition that goes back hundreds of years, right? Bob Pawlo: It was time for change. Valerie Naranjo: Yes. and Chief Karbo had the wisdom to know that I could help. I had the prayer to be able, during my first trip to Ghana, to contribute something meaningful. I knew that when Americans and other foreigners study in West Africa, they bring their little bit of money, learn these amazing traditions, and go away leaving very little for the people. And I didn’t want to do that, so I really felt that Chief Karbo answered that prayer for me. That began many journeys and many wonderful relationships with my mentors and their communities who have been so generous to teach me this wonderful art. Bob Pawlo: How do you handle controversy as a woman playing a “man’s instrument” in what’s been a man’s world for so long, in so many situations that you work in? What’s your approach as a trailblazing woman, if you will? Valerie Naranjo: I was prepared to blaze trails at home. In the Native American and Hispanic community, if you are called to be a healer or a creative artist, that is considered worthy of respect, so my work was supported. I think of Tommy Tall Bird in Shiprock, New Mexico among the Navajo people. That child was eight years old and was respected because he would sing at school and tell other kids, “We’ve gotta keep our traditional music alive.” Here in New York my prayer is to be able to work with honest, hardworking artists. Bob Pawlo: Let’s talk about how you got hired for Saturday Night Live. 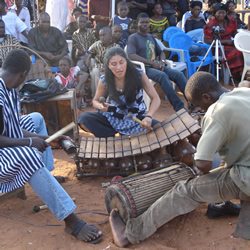 Valerie Naranjo: When I came back to NYC from Ghana, I started playing clubs with a trio. Instead of taking one instrument, I would take two, and would play one with one hand and one with the other. The gyil has two distinct things going on in the left and right hand. People would ask “How do you do this?” I didn’t have any secret, except that I studied the gyil. Eventually, I met the great composer Philip Glass, and while I was recording in his ensemble, I met the lovely Roger Squitero. Roger was a percussion player for Lenny Pickett. Lenny was looking for someone to play rock-hard, four-mallet xylophone, so Roger recommended me. One day I walked into Drummer’s World, and Lenny was there, shopping for an instrument. He said, “This is funny that you walked in right now, because we were looking for you in the union book, and we realized you’re probably not in the union.” I joined Local 802 right away. I ended up playing with Lenny’s group for some time. At some point, I had to sub the gig out and didn’t hear from Lenny for a while. Eventually, I joined a pop band led by a very respected musician. I got fired from that band. There were issues that I was “too expressive.” It was really a time of darkness for me. I thought, “My career is over.” (I think everybody has one of those moments.) After a lot of reflection and a lot of Buddhist practice, I realized one day, ” I’m okay. I just need to believe that I have something to say and that there’s a place for me.” I got a call from Lenny the next day. He told me, “We have been considering you for the Saturday Night Live band.” That was 20 years ago and the rest is history. Lenny and co-director Leon Pendarvis are my heroes. They are outrageous musicians who have the generosity to help us feel like a great and happy musical family. In studio 8H, as in my childhood, our job as musicians is to lift up the people in the room – in this case, to keep the live studio audience entertained while the television audience is watching commercials. We also back up musical sketches. I really love working there because there’s no nonsense. There’s no room for ego. We have to work quickly, and in a concentrated manner to produce a live show. Bob Pawlo: How do you choose the instruments that you’ll play for that particular episode? Valerie Naranjo: On Friday evening, our librarian sends a list of tunes that we’re going play. On Saturday, 20 are chosen from a list of about 40 tunes. Some pieces we’ve played for many years. Others – sketch pieces especially – have just been written and may be re-written throughout the day. We can receive a last-minute update in our in-ear monitor during the cold opening. Bob Pawlo: Are the parts written out for you, or are you given a sketch to work from? Valerie Naranjo: Some of them are specific, especially mallet parts. And some are “go for your own.” One of our great directors, Eli Bruggemann, interfaces between the comedians and the band to produce musical sketches. Often I’ll have a chart, and he’ll make suggestions and requests, so it’s a combination of improv and specific directives. Bob Pawlo: What’s it like working with Sean Pelton? Valerie Naranjo: Sean is one of my favorite musicians. He’s a funky perfectionist. He’s all about the groove, and about things being just right. And he doesn’t take himself so seriously, so he makes a very comfortable atmosphere for all of us. Just being in his groove and in the groove of everybody is an honor and a privilege. Bob Pawlo: We need to segue to “The Lion King.” How did that come up, and what’s been your experience there? Valerie Naranjo: I was playing on the subway platforms, in the Music Under New York program. That’s the most difficult place to take a marimba! The composer Elliott Goldenthal wandered over to my marimba and stood literally four inches from my head to watch me play something. He’s a genius – and he’s also the partner of Julie Taymore. When I finished he said, “Julie and I are doing a production of ‘The Tempest’.” Could you join us?” From there I did several things with them. One day Julie told me that she got a call from Disney to direct “The Lion King” on Broadway. I hadn’t even seen the cartoon movie version at that point! But I was fortunate to be the first musician hired, and it’s been nothing but a joy. I love daily Buddhist ritual and I love the ritual of music theatre. When lighting, costume, writing, music, acting, dance and makeup all come together to produce a message, it’s a very special thing. There is a concept in my Buddhist tradition that’s called Cho No Ichinen. The life condition of the leader or the central person permeates an activity. Julie is a legendary director, and our music director Karl Jurman is wonderful! Every time I play “Circle of Life” – and see the look on the faces in the front row of the audience – it’s great! Bob Pawlo: Can you tell me a few stories about others you’ve played with who have inspired you? Valerie Naranjo: The most wonderful thing about playing with Paul Winter is his commitment to the potential of music as a vibration. He’s a gifted musician who always chooses a particular combination of musicians based around a theme. Philip Glass also believes in the power of vibration first and foremost in his music. The Philip Glass Ensemble went on a European tour when his wife was suffering from cancer. He did not blink an eye; he did not frown. When he had to leave the tour, he gave his keyboard part to me, which initially terrified me! Philip’s commitment to the ideal that “No matter what, we’re moving forward and everything will be fine,” was a total mindblower to me. And I have such respect for Tori Amos. She sings about the abuse that she’s encountered. So many of her fans contacted her that she actually created a hotline so that people who are abused could have a friend and someone to reach out to. I love every group I’ve played with, yet my favorite group that I’ve been privileged to co-direct with my husband, multi-instrumentalist Barry Olsen, is the quintet called Mandara. Three musicians (Vince Cherico, Bryan Carrott and Leo Traversa) were chosen not only for their incredible musicianship but for their commitment to music as a means to create healing and unity, and for their love of African and Afro-Cuban music. Bob Pawlo: How has your experience of playing and composing Western music as a percussionist been improved by the more traditional music? 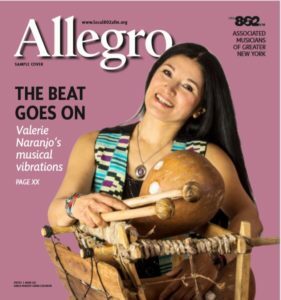 Valerie Naranjo: Traditional music first and foremost requires that you become totally technically proficient. Excellence is taken for granted. You are not judged by the amount of technique you have, but by your ability to lift the life condition of your audience. To always have your audience at the center of your mind’s eye is very traditional, and that training has been good for me every time that I step on the stage or onto a bandstand. Bob Pawlo: What message would you give to musicians beginning their careers in this day and age? Valerie Naranjo: Really believe in yourself. If you do, you’re going to take care of yourself. You’re going to seek the physical, mental, spiritual and musical means to improve yourself and to keep creating. You’ll find mentors who will empower you and allow you to discover yourself. Don’t try to outsmart the market. If you are true to yourself, you’re going to create something that’s unique, and there’s going to be a place for you. Remember that no matter how well you do, no matter how accomplished you are, there’s always going to be someone who loves it, someone who hates it, and someone who doesn’t care. So don’t worry. Bob Pawlo: Valerie, there’s a thousand more questions I’d like to ask you, but our time’s up. What would you say in closing to our Local 802 brothers and sisters and to union members around the world? Valerie Naranjo: My experiences have helped me to respect community. Community involves all kinds of people – those who produce the food you eat, the gigs you attend, the clothes you wear, and the people who safeguard your intellectual property. To ignore any aspect of community is to ignore yourself and the fortune that you are entitled to. We must understand that the union is working for our creativity, so that we can relax and do what we do. Let’s appreciate, join, and be a part of it.